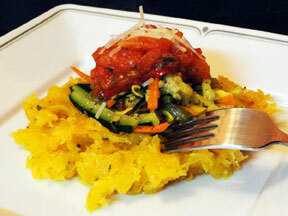 Carefully slice spaghetti squash in half and cook in the microwave, skin side up, for 15 minutes. Be careful when removing the squash from the microwave as it will be very hot. Once cooled, the squash will be translucent in color and soft. Scoop the squash out of the shell and set aside. In a large sauté pan, add 2 tablespoons of olive oil on medium high heat. Add garlic and onions and cook until lightly browned. Add the spaghetti squash and stir. Add fresh parsley and sprinkle some Parmigiano Reggiano cheese. Put the spaghetti squash in a large bowl and set aside. Cut the green squash, yellow squash, carrots and peppers into thin strips. In the sauté pan, add 2 tablespoons of olive oil and the strips of vegetables. Cook until the vegetables are done. Season with salt, pepper and basil and pour the vegetables over the spaghetti squash. In the sauté pan, add the cut up plum tomatoes with the skins removed. Sauté the tomatoes for about 5 to 10 minutes. Pour the tomatoes on top of the vegetables and sprinkle with Parmigiano Reggiano cheese. Serve with bread or salad.